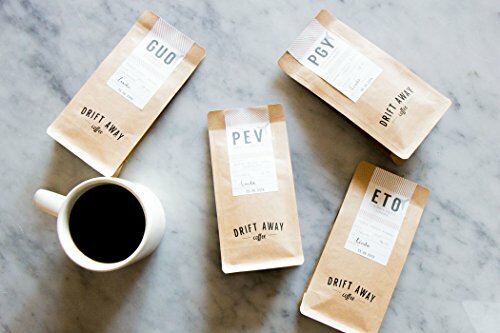 Home » The Best Coffee for Chemex On The Market! Chemex is growing on coffee lover’s radars, but Chemex is no ordinary coffee maker. The glass, hourglass-shaped coffee brewing system at first looks more like a pitcher than a coffee maker, but it’s this innovative design that produces what the company says is some of the best coffee. Heat resistant glass pairs with an insulated handle and polished wood collar for both an elegant and uniquely designed way to brew. Quixotic as it may seem, Chemex has a specialized brewing process that has compared to drip coffee, but still has its own unique steps. And while there is plenty of room for mistakes, Chemex, when used correctly, should produce coffee with bold flavor, low acidity, and plenty of strength. Of course, any brewing method is not the only factor that goes into quality coffee. Finding the best coffee for each purpose and brewing method is also essential. But what coffee works best with Chemex? We’ll take a look at Chemex itself and its brewing process to determine what coffee roast, coffee grind, and coffee type work best. What is involved in the Chemex brewing process? What are the advantages of using Chemex? Does it really brew good coffee? Is there anything else I should know about Chemex? Accessories can improve your experience with Chemex. How do I select the best possible coffee for my Chemex? Avoid more oily coffee beans. Not sure where to start? No problem; take a look at some of our top picks below. Grind coffee. Coffee should be coarse, like salt, which is finer than some automatic machines might need, but not quite as fine as what you’d use to produce an espresso or for a Moka Pot. Measure coffee and water. A ratio of 50 grams of coffee to 700 grams of water is recommended, so you may want to invest in a small scale. Small scales are pretty useful for a number of kitchen functions, but especially if you’re using the Chemex or a manual coffee or espresso maker. After you try this ratio, you can always adjust to taste. Place a filter into the Chemex. Filters do not come with Chemex, so you’ll have to purchase one of your own. You can find affordable coffee filters directly through Chemex, which will ensure that they fit. You could also check the measurements and buy filters through more whole-stock outlets. The folded part must face the spout. Cover the filter fully with hot water. Water must be hot, not warm, and it’s important you completely cover the paper filter. (If you want to purchase a filter on your own, check out our guide to best filters first). Pour coffee into the filter, making sure it lies flat. Then you will do a series of four separate pours, the first in the center, and slowly working your way out. Pausing for just under a minute between each pour allows the flavor and aroma to develop more, so be patient. Water should be added slowly to ensure even brewing. The process is complete: Your results may vary, especially if you pour too quickly and if you did not use coarse enough of a grind. As you can see, there’s plenty of room for error, and unlike automatic brewing machines, you are very much in control over every step. Considering that the brewing process takes about four minutes overall, and if you add in set up and clean up, expect to spend ten to fifteen minutes for the process. 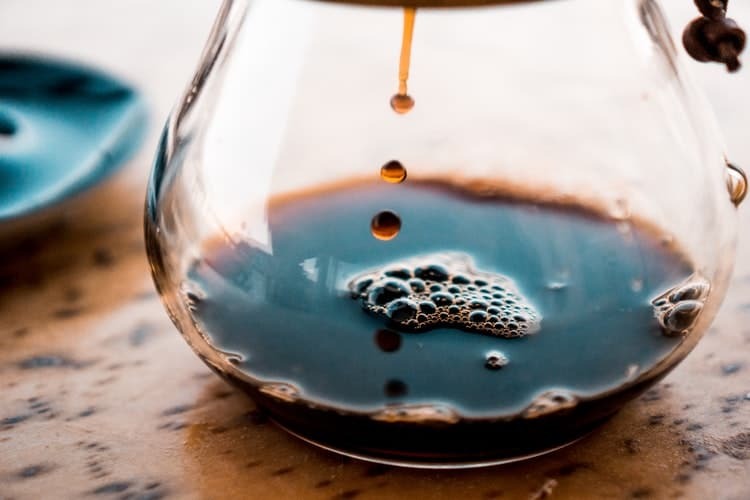 For starters, Chemex is a good option for anyone who prefers more traditional brewing methods and who wants to have more control over the entire coffee brewing process. Customization is important too, and with a Chemex you can easily do that, experimenting with different coffee to water ratios, different roasts and different types of coffee beans. With fully automatic or semi-automatic machines, you can sometimes run into issues, especially ones that use pods, where you have to settle in terms of making your coffee drink unique to you. But that aside, there are a few other benefits, which are more unique to Chemex. The simple design is said to produce a cleaner more natural flavor, result in lower acidity, and enhance natural flavors and aromas because there are less equipment and manipulation involved in the brewing process. In addition, using a Chemex is more eco-friendly, cutting down on energy usage because it does not require electricity to operate. The only heat required is initially heating water to a hot temperature. Plus, it’s a pretty small investment considered to many brewing options. A starter kit, which includes a Six Cup Classic Coffee Maker, a box of filters, glass cover and coaster runs just over sixty dollars. Add in the small size for easy storage and mostly easy maintenance, and there are plenty of reasons why, if you have time and a little dedication, that Chemex could be one of the best coffee brewing methods for you. While we aren’t using this article to do a full review of Chemex right now (be sure to check out all of our other featured coffee maker, espresso machines, and stovetop makers reviews), we do want to make a note of just a few more things that might impact your purchase, or what do with your already purchased Chemex. with unique design options, such as different rawhide colors, a laser engraved collar, and sandblasted carafes with designs of your choice. Of course, this won’t change anything except aesthetics, but it will make the Chemix feel like it’s truly yours. Customizing also makes a great gift for coffee lovers. Replacement parts and additions can be a great way to ensure you have a better cup of coffee, but it’s possible to comparison shop for some items. Among accessories, you can purchase, Chemix makes glass mugs, rubber ball steam stoppers, and cleaning brushes. 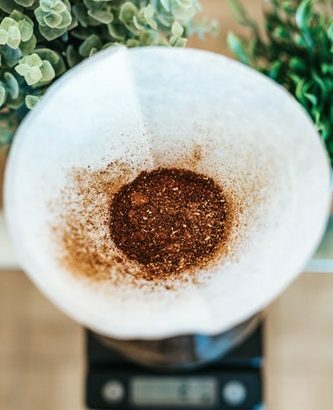 Coffee filters are essential for brewing, so we suggest purchasing directly from Chemex when you start brewing coffee. Not including different cup sizes. 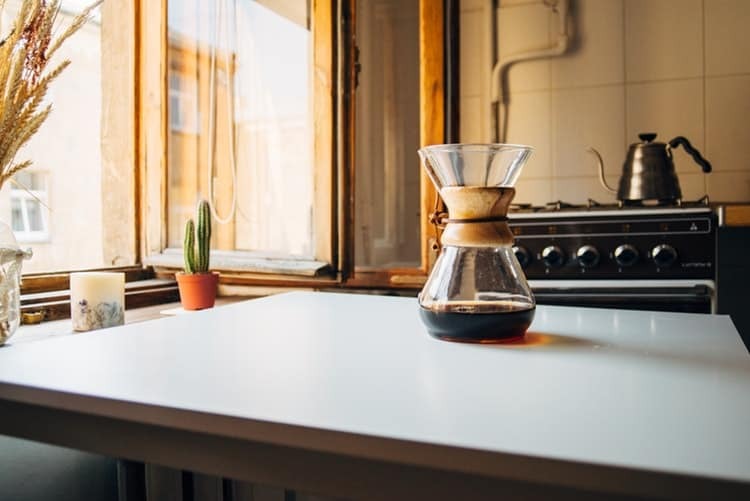 However, between the Classic Series, Glass Handle Series, and Handblown Series, most of the differences do not affect the actual brewing process, or the coffee itself, but rather the general aesthetics. All varieties are available in three, six, eight and ten cup versions. Finding the best coffee for any brewing process is partially specific to the brewing method, partially to individual tastes. As a general rule, you should always get to know the coffee so to speak, as well as you can. The highest quality coffee is one that has not been mass produced, and, unfortunately, is not often found in your local grocery store. Mass produced, heavily commercialized coffee brands tend to come from many origins, tend to be a lower coffee grade level, and may not have as much in the way of aroma and flavor. They also do not tend to adhere as much to quality standards and have some oversight, but may not be as carefully checked for defects. The issue is, when you’re using a Chemex, you need to be especially selective about the coffee you purchase. That’s because, as it’s a manual brewing process, there’s not only more room for error, but there’s also an even more of an emphasis on the quality of the coffee you use. While there are many reasons to search for organic, versus conventionally grown coffee, they are by no means limited to possible health benefits. Organic foods and beverages must have a USDA certified label and are regulated for the way they are grown. Organic coffee is coffee that is grown without the use of synthetic fertilizers or pesticides and herbicides, and there is restrictions as to the proximity to chemicals, though some factors, such as runoff and violations, means that organic coffee is not always a hundred percent free of such chemicals. Still, organic coffee has a brighter, fresher taste, even if the difference is subtle. Chemicals can lightly impact the aroma and flavor notes, so organic coffee tends to more fully display the best of coffee’s traits. Plus, much of organic coffee is more associated with smaller plots, with more attention and care paid to the coffee fruit, resulting in a fresher tasting coffee for you. Of course, who doesn’t like the idea of freshly roasted coffee? But how do you ensure your coffee is as fresh as possible? It’s especially important because with a Chemex you’ll be paying extra attention to the quality of the coffee itself. One way to ensure the coffee is as fresh as possible is to look for the coffee roast date. The roast date can’t tell you everything, but it does give you an indication as to how fresh it really is. Ideally, you should use coffee within a week of the roast date. While tightly sealing coffee after opening is also helpful for keeping your coffee fresh, buying coffee in smaller packages you’re likely to use more quickly is your key to freshly roasted beans. Single origin coffee is coffee that comes from an individual and specific coffee growing region. Single origin coffee tends to have more unique and specific characteristics when compared to coffee that has been grown and cultivated in a variety of regions. Single origin is also only grown during a particular season, which means it was grown during the best climate possible for its health. Finally, single origin more directly connects you with a specific region and will provide a more unique brewing experience. 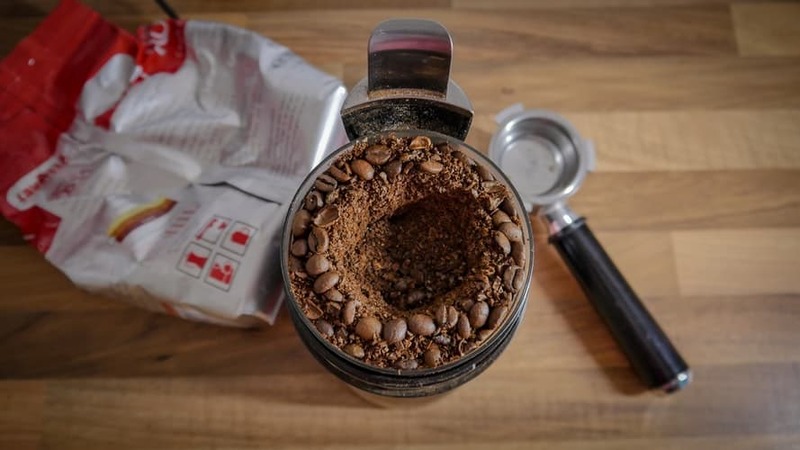 While you will need coarsely ground coffee for brewing, and need to also invest in a great coffee grinder, you should consider purchasing whole bean coffee. The whole bean stays fresher because there is less degassing that takes places as when you grind coffee. In fact, for the brightest and freshest brew, you should brew the coffee beans immediately after grinding. And as a bonus, it’s easier with whole bean coffee to tell if there are any defects after your purchase. While these coffee beans tend to be delicious, those with richer flavor notes are more fully developed with an espresso machine or French press. The brewing process with Chemex does better with coffee with more sharp or flatter flavors. While everyone has different preferences when it comes to their preferred coffee roast type, a medium roast strikes a great balance. 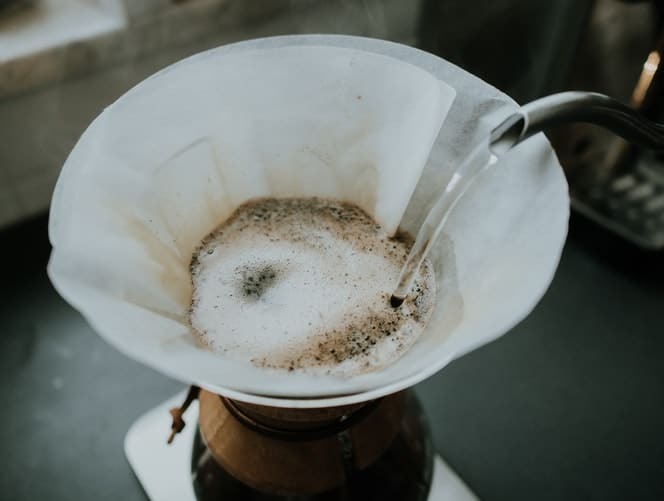 While dark roasts will work with a Chemex, like the richer flavor profiles, the simple drip process does not allow those flavors and aromas to develop as fully, which is especially important for dark roasts. Medium roasts will not hide the flavor as much and still provide a bit more character than a light roast. However, if you’re making a specialty drink, a light roast will also work with a Chemex. While natural oils are a great thing, very oily coffee beans may not fare as well with the Chemex brewing process. We’ve mostly tried to adhere to our guidelines, with few exceptions. All of the Coffeen below is a single origin, whole bean, and received good to excellent average customer ratings from Amazon customers. While the listings below are from Amazon, feel free to purchase directly from the coffee producers’ sites–we actually encourage it. The medium roast of this single origin, organic whole bean coffee features an acidic and medium body brew. It’s also fair trade and Kosher and supports local economic stewardship. The Arabica coffee beans are grown at a high altitude for optimal results. 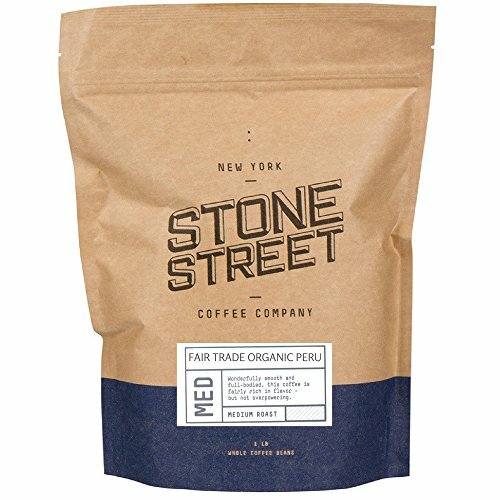 Organic coffee from Peru, with low acidity and a light-medium body. It features a slightly nutty and sweet, smooth finish after it’s been brewed, which would work well with the Chemex coffee brewing process. 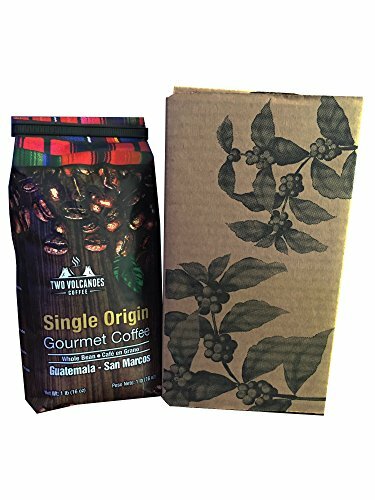 This coffee comes from a particular growing region: at the base of two volcanoes in a region of Guatemala, hence the product name. Flavor notes are earthy, with balanced aroma and flavor. 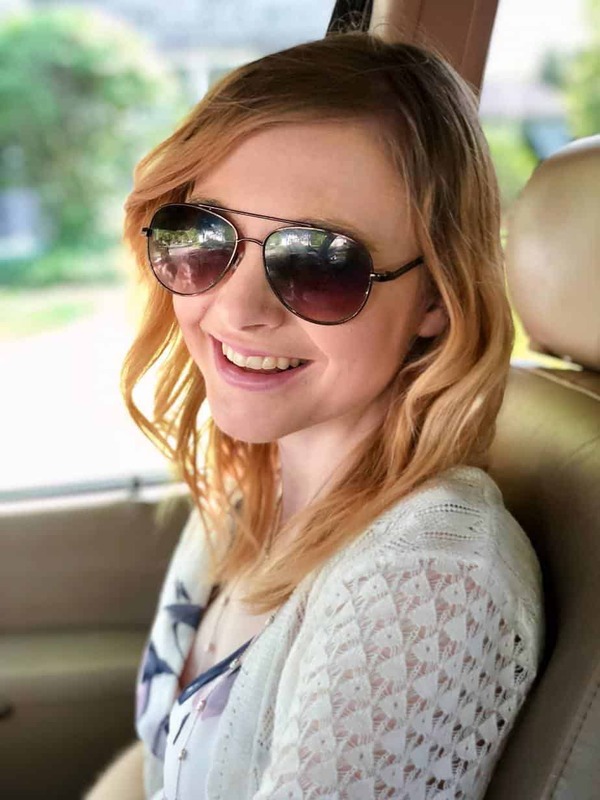 The coffee beans have been roasted in small, individual batches, packaged immediately after roasting, and even come with a degassing valve in the package to ensure the freshest coffee possible. This coffee is produced in compliance with the Rainforest Alliance, which supports sustainable farming practices and agriculture. 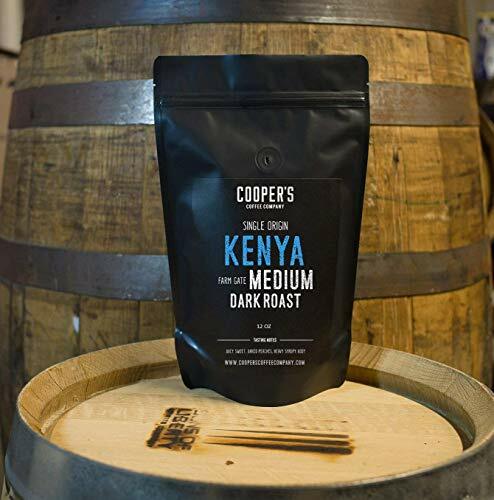 It’s also a small batch and craft roasted and creates a smooth finish with low acidity. Do note that this is a blend, so it is not a single origin. 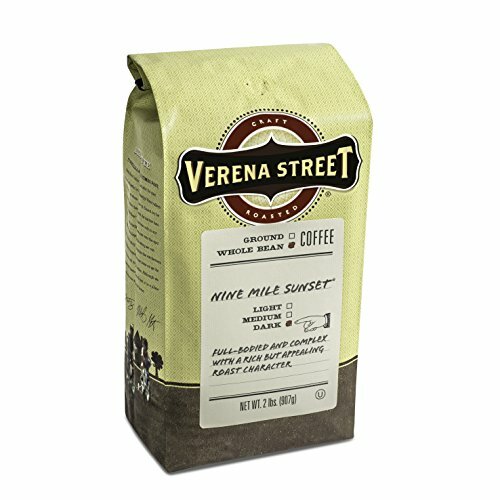 If you really are a dark roast lover but still want the best possible complement for Chemex, consider giving this coffee a try. Smooth bodied, with a full flavor, it’s a medium-dark roast that’s the best of both medium and dark roasts. With touches of honey wheat and molasses, these whole coffee beans are also roasted in small batches. 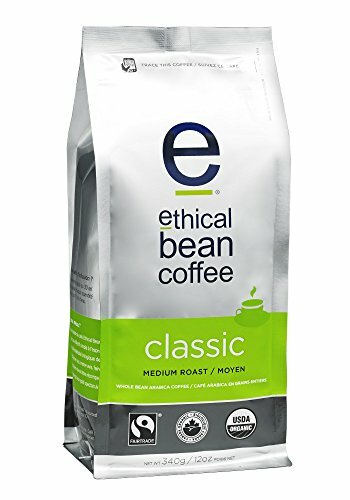 Plus, as a bonus, the coffee beans are Fair Trade, organic, and have been given the highest grade rating possible, meaning they are almost completely free of defects. If you’re in search of coffee for Chemex but have no idea where to start, a sampler is a great idea. But since it’s hard to find a sampler meeting our qualifications mentioned above, we found one for you. All coffee in this sampler is a whole bean, single origin, and dedicated to local sustainability. Light, medium and light roasts come from small shareholders in Columbia, Myanmar, Mexico, and the Democratic Republic of Congo. The beans are roasted in Brooklyn, New York, so there’s less time between when you receive them and the initial roasting process. A quick note: our advice centers around the majority of Chemex products, with the exception of Chemex Ottomatic, which is currently out of stock without information as to when it will become available again. This product automatically adjusts for pre-infusion, contact time, and contains a hot plate, so it is still not a fully automatic machine. Nespresso vs Keurig in 2019: Find Out Which is Best for You?